We are the Merseyside members of the IWW (Industrial Workers of the World) – the union for all workers! 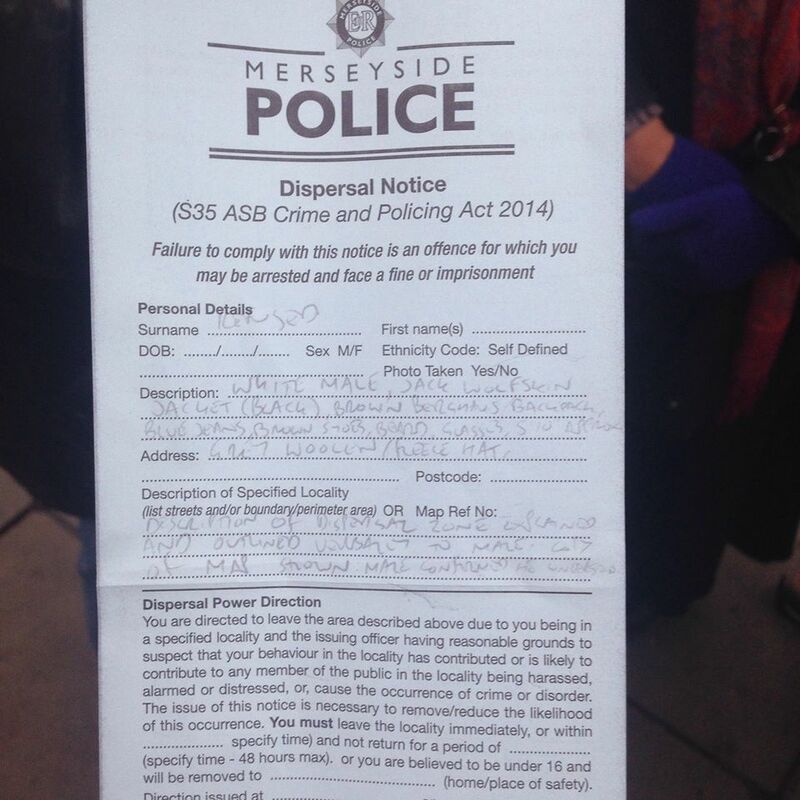 Liverpool IWW condemns Merseyside Police’s use of Dispersal Notices to control activists in Liverpool city centre. Merseyside Police used this legislation against activists for the first time on Saturday 22nd November. People taking action with the Liverpool Rise For Palestine group were presented with a Dispersal Notice during their weekly protest against shops linked to support for the government and economy of Israel. This itself followed heavy repression of an anti-fur trade demonstration in the city the previous Saturday, when three protesters were arrested outside Harvey Nichols, and released on bail conditions banning them from the town centre. This Saturday (29th), the activists who had gathered in Liverpool city centre were not actually intending to protest anything. In fact, they were deciding where to go for a drink when police officers came over to ask about their plans. When no real answer was given, the activists were given the Dispersal Notices, which banned them from large areas of the city centre until 6pm. This developing pattern suggests that police are working with businesses in the area to suppress political expression during peak shopping times in the run-up to Christmas. While this is completely unacceptable in of itself, it also sets an extremely worrying precedent. Will Merseyside Police – and other forces around the country – use such a pretext into the new year? Undoubtedly they will try to. As people commented on Saturday, this legislation appears to mean that cops can trample on democratic rights at will, since they are not required to present any proof that harassment or crime is intended. One officer farcically commented that activists may have “polystyrene balls”, and these “may cause distress”. However, when invited to search for these mysterious balls, he declined. So essentially, the say-so of a cop “of at least the rank of inspector” is all that’s needed for this clampdown to be legal. However, the legislation also declares that police officers “must have particular regard to the rights of freedom of expression and freedom of assembly” set out in articles 10 and 11 of the Human Rights Act 1998. On the previous Saturday, it is clear that freedom of expression was trampled. This Saturday, it was freedom of assembly’s turn. We therefore believe that the officer “of at least the rank of inspector” who issued the Dispersal Notice themselves broke the law. In fact, it appears Merseyside Police saw the 2014 Act as merely the best cover for their real agenda – protecting and serving the rich and powerful. 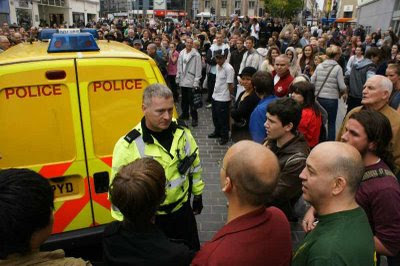 This level of police repression of Liverpool activists has arguably not been seen since the ‘capital of culture’ days of 2007/08, when increasingly regular state harassment of campaigners saw a broad umbrella group come together to oppose the police. On 11th October 2008, designated ‘Freedom Not Fear day’, ten different organisations held stalls on Church Street. Police tried to seize literature and people, but the general public became enraged, and blocked their vans for over an hour. Stunned by this, Merseyside Police had adopted a much more ‘hands off’ approach until recently. Though Liverpool IWW are yet to experience any repression of our new group’s activities, we hope a diverse group of activists will once again stand up to the state’s attacks. The only freedom we have is the freedom we struggle to win and defend! An injury to one is an injury to all! This entry was posted in liverpool, police, repression and tagged liverpool, Liverpool city centre, Merseyside Police, police, repression on December 1, 2014 by liverpooliww.